"That's a concussion...he doesn't know where he is." 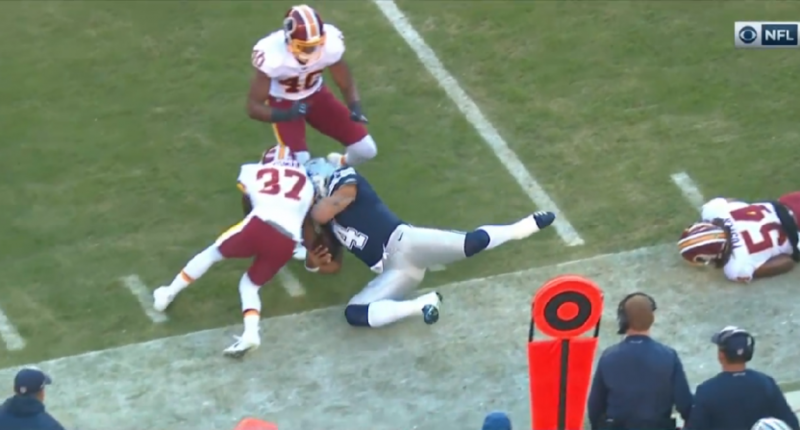 In one of the scarier moments of the NFL season so far, Dallas quarterback Dak Prescott took a direct shot to the face while attempting to dive for first down yardage. It was such an obvious shot to the helmet, and Prescott was so apparently in distress, that CBS analyst Tony Romo immediately proclaimed it a concussion. Romo: Oh no…that’s a concussion. Helmet…yeah, he’s going to be done. He doesn’t know where he is. It was startling to hear a broadcast so quickly acknowledge the possibility of a serious head injury, but maybe that’s a combination of Tony Romo’s recent NFL experience and a lack of filter. And while we probably don’t want broadcasters making judgment calls on medical diagnoses, especially for things like concussions which are notoriously difficult to diagnose, but Romo and Nantz erring on the side of a concussion occurring felt like a change. There was even a shot of the blue medical tent, with Tracy Wolfson reporting Prescott was going through the concussion protocol. Once it became apparent that the Cowboys were going to try and get Prescott back in the game, though, the tone changed quickly. Romo: I used to wake up when I would hit, dinged up, and be like just give me a second, it’s coming back to me, the stars are going away. And Dak is back. But, once he completed a few passes, everything was back to normal on the broadcast, even though it had to be hard for some viewers to just assume Prescott was fine, especially when he ended up scrambling and diving forward once again very shortly after his return. It was an odd disconnect, to go from being told Prescott was done to seeing Prescott hurling himself head first to the effusive praise of the telecast. Especially when we know concussions aren’t always able to be diagnosed immediately, and even more especially when we know the dangers of taking a shot to the head in the aftermath of suffering a concussion. Prescott has played pretty well in his return, and maybe he really is totally fine. But it’s tough to see a player take a shot like that and get sent right back out there, and it’s tougher still to hear a broadcast so quickly abandon the reality of football’s concussion risks.